Pneumocephalus is defined as the presence of gas within the cranial cavity. Gas in the cranial cavity commonly results from trauma,  tumor,  after surgery,  following diagnostic procedures  and rarely from infection. Pneumocephalus occurring with meningitis is well described, its occurrence in Staphylococcal meningitis is rare. A case of pneumocephalus associated with meningitis and empyema caused by Staphylococcus aureus, which was managed successfully, is reported here. A twelve year old female child presented with fever, headache, back and neck pain, vomiting and cough of 20 days duration. She also had abnormal behaviour for the last 10 days. Fever was moderate to high grade and was associated with dry cough and mild chest pain. There was no history of any head trauma, seizures or any ear or nose problem. On general examination, the child was stuporous, mildly febrile with pulse 110/minute, Respiration rate (RR) - 24/minute and Blood pressure (BP) - 130/90 mm Hg . On chest examination, impaired breath sounds with crepitations were heard on both sides. On examination of the Central Nervous System (CNS), pupils were normal in size and reaction, but meningeal signs (neck rigidity and Kernig's sign) were present. Therefore, a provisional diagnosis of meningitis with pneumonia was made and the child was investigated accordingly. Her blood examination showed Hemoglobin (Hb) - 9 g/dL, total leucocyte count (TLC) - 21.4 ×10&#3/μL (Neutrophils (N) - 89% and Lymphocytes (L) - 11%) and chest radiograph revealed lower lobe consolidation on the left side and patchy consolidation on the right side. The child underwent a computed tomography (CT) brain scan study, followed by Cerebrospinal fluid (CSF) examination. The CT scan showed bilateral diffuse pneumocephalus, including air in the ventricles with no bony abnormalities, any communication with sinuses or any evidence of a space occupying lesion [Figure 1] and [Figure 2]. CSF study revealed - glucose 42 mg/dL, proteins 198 mg/dL, cells - 900/μL (N - 80%, L - 20%) and Adenosine Deaminase (ADA) < 5 IU. However, Gram's staining was negative and no organism was grown on culture. Enzyme-linked immunosorbent assay (ELISA) test for Human immunodeficiency virus (HIV) was negative. Her serum electrolytes were normal. She was put on empirical antimicrobial therapy along with supportive treatment. After three days of admission, she developed bilateral pleural effusion. Pleural fluid was purulent; it showed Gram positive cocci on staining and Staphylococcus aureus grown on culture. Her treatment was modified according to sensitivity - to vancomycin (60mg/kg/day, intravenous), ceftriaxone (100mg/kg/day, intravenous) and levofloxacin (10mg/kg/d, orally). Besides the antimicrobial coverage, she was put on intercostal drainage. Her pyothorax resolved within 5 days and the child also showed overall improvement. However, the treatment was continued for two weeks and the child continued to register significant clinical improvement. Her CSF examination and CT scan, repeated after two weeks, were normal and the chest radiograph also showed resolution of pneumonia. She has been found symptom free on regular follow up. In the present case, there is clear evidence of pneumocephalus along with meningitis and lung infection (pneumonia and empyema). Though no organism was grown on CSF culture, the pleural fluid did show the growth of Staphylococcus aureus, indicating that the meningitis in all probability was caused by the same organism, i.e., Staphylococcus aureus. In a review of 290 patients of pneumocephalus by Markhan,  while infection was responsible in 8.8% cases only, trauma was the principle etiological factor (73.9%), other factors being tumors (12.9%) and surgical intervention (3.7%). CT scan of paranasal sinuses and of temporal region failed to reveal any congenital bony deformity or breach in the cribriform plate/sphenoid sinus which could be responsible for pneumocephalus. Lumbar puncture as a possible cause of pneumocephalus can safely be ruled out in this case, as it had been noticed on CT scan of brain before doing lumbar puncture. The presence of pneumocephalus in the absence of injury or surgery should raise the suspicion of infection of central nervous system. Treatment of pneumocephalus depends on the clinical condition of the patient, the degree and progression of air collection and of course the etiology. Most cases resolve with conservative treatment and close monitoring. Surgical intervention is usually not indicated, unless there is continued CSF leak or progression of pneumocephalus to a tension condition. In the present case too, the pneumocephalus resolved completely within a few weeks. We are thankful to the management of the SRMS Institute of Medical Sciences, Bareilly for all the help and support, particularly in getting the treatment and investigations done for this patient free of cost. We also acknowledge with thanks, the general guidance given by the department head, Prof. A. K. Rathi. 1. Slattery WH 3rd, Francis S, House KC. Perioperative morbidity of acoustic neuroma surgery. Otol Neurotol 2001;22:895-902. 2. Rao G, Apfelbaum RI. Symptomatic pneumocephalus occurring years after transphenoidal surgery and radiation therapy for an invasive pituitary tumor: A case report and review of the literature. Pituitary 2003;6:49-52. 3. Kozikowski GP, Cohen SP. Lumbar puncture associated with pneumocephalus: Report of a case. Anesth Analg 2004;98:524-6. 4. Maliwan N. "Spontaneous" pneumocephalus associated with mixed aerobic-anaerobic bacterial meningitis. J Infect Dis 1985;152:847-8. 5. Markhan JW. The clinical features of pneumocephalus based upon a survey of 284 cases with report of 11 additional cases. Acta Neurochir (Wien) 1967;16:1-78. 6. Skiles MS, Covert GK, Fletcher HS. Gas-producing clostridial and non-clostridial infections. Surg Gynecol Obstet 1978;147:65-7. 7. Tanaka T, Takagi D, Takeyama N, Kitazawa Y. 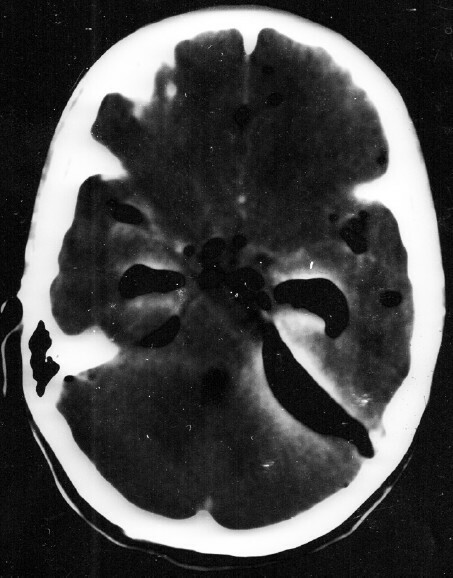 "Spontaneous" pneumocephalus associated with aerobic bacteremia. Clin Imaging 1989;13:134-9. 8. Penrose-Stevens A, Ibrahim A, Redfern RM. 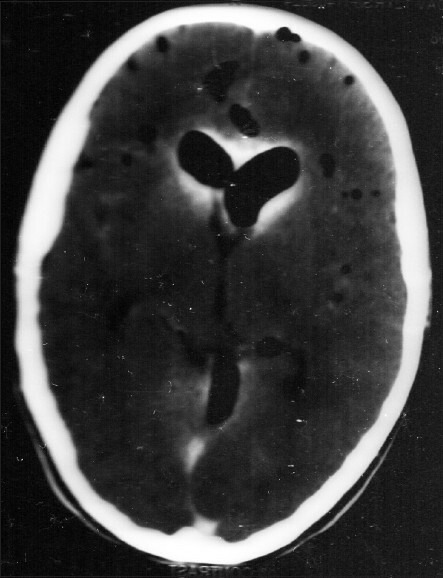 Localized pneumocephalus caused by Clostridium perfringens meningitis. Br J Neurosurg 1999;13:85-6. 9. Roberts FJ, Smith JA, Wagner KR. Staphylococcus aureus meningitis: 26 years' experience at Vancouver General Hospital. Can Med Assoc J 1983;128:1418-20. 10. Fisher MC. Other Anaerobic Infections. In: Kliegman RM, Jenson HB, Behrman RE, Stantan BF, editors. Nelson Textbook of Pediatrics. 18th ed. Philadelphia: Saunders; 2007. p. 1232. 11. Ceobra A, Berto A, Borgonzoni M, Grasso DL, Martin A. Pneumocephalus and meningitis as a complication of acute otitis media: Case report. Acta Otorhinolaryngol Ital 2007;27:87-9. 12. Bhat BV, Verma IC, Puri RK, Srinivasan S, Nalini P. A profile of pyogenic meningitis in children. J Indian Med Assoc 1991;89:224-7. 13. Singh H, Sarkar R, Sachdev HP, Saini L. Immunological tests in acute bacterial meningitis. Indian Pediatr 1988;25:323-8. 14. Ajalloveyan M, Doust B, Atlas MD, Fagan PA. Pneumocephalus after acoustic neuroma surgery. Am J Otol 1998;19:824-7.